An open performance on diversity and coexistence, a collective thought process stemming from the body and in constant movement. An opportunity to act in our reality. From the premiss: everyone has voice, Theater for Inclusion presents in tree scenes the “Excluded Voices” story. The story of everyone of us in our dayly life, our story. Every person has a story to tell. In every story, the person who tells it is the main character. We are the main character of our own lives and supporting actors in the lives of others. With these scenes we ask: What makes me valuable to society? Where are the barriers that make it harder for people to access and be a part of a community life? Are these barriers visible to all? Original creation by IMPRODUCTIVOS in Vienna 2016 after a 5-months collective creative process. READ MORE ABOUT IT!! CLICK HERE for previous acctions and know more about the SZENO-FORUM. 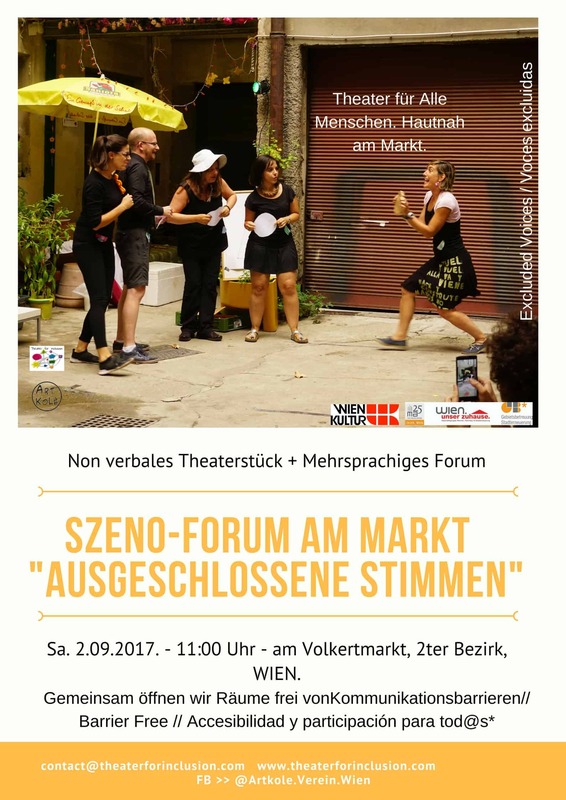 WOULD YOU LIKE A SZENO-FORUM WITHIN YOUR COMMUNITY? Write us an eMail contact@theaterforinclusion.com and we will be glad to be in touch with you! !